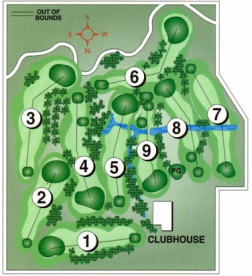 The 9-hole course at the Tecumseh Country Club, Inc. facility in Tecumseh, features all the hallmarks of Nebraska golf. Tecumseh Country Club is a short, rolling layout in the countryside west of town. The raised greens are domed, midsized, and in good condition. The rough consists of a variety of grasses and is mowed down to a playable height. A mix of trees are in play on several holes. Men's league begins mid-April and is played every Tuesday and Wednesday evening. The Director of the Men's league is Richard Ziegler. Women's league starts in mid-April and is played every Thursday evening. The Director of the Women's league is Allison Caspers. Couples league is played every Friday starting mid-April. The Director of the Couple's league is George Weiss. Please visit their website for upcoming tournaments and events. Membership prices are dependent upon your residence proximity to the golf course and must be paid prior to playing open or league golf. Click here for membership dues. Green fees begin at $10 per day and are based upon weekday or weekend playing. Click here for more information. Kirkman's Lakeside Golf Course is just a short 45 minutes drive southeast of Tecumseh. Kirkman's Lakeview is a 9-hole, 3270 yard course wrapped around Kirkman's Cove Lake. For more information, check out their website here. Just 45 minutes west of Tecumseh, the Beatrice Country Club offers 18 holes of championship golf, with a unique course design combining traditional tree-lined and Scottish links-style holes. Check out their website at http://www.beatricecc.com.